We’ve heard about it and tracked its progress, but now the wait is over, and the highly anticipated 2019 Toyota Avalon is finally here. The remodeling of the Avalon creates not only a fuel-efficient vehicle, but also one that is now stunning to watch. Along with the newly redesigned body, new color options are available as well, unique to the Toyota Avalon. 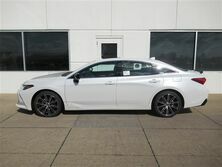 The newest generation of the Toyota Avalon brings about new technology as well as a fresh look, while still staying true to the Toyota quality that we all trust. Class and sophistication are united in this new model, no matter what trim level you choose, so let’s take a closer look. The quiet interior of the car can help you concentrate even in the noisiest part of town, and listening to your music won’t be an issue, either. With surround sound and 14 speakers, the Toyota Avalon ensures that no person in the vehicle is left out of the music experience when travelling. The 9-inch display audio touchscreen in the front provides an excellent surface to surf for music, map locations, or nearby dining. The 2019 Avalon is also the first Toyota vehicle that has Amazon Alexa and smartwatch connectivity, so starting your car, checking the fuel level, and locking or unlocking the car can now be done remotely. Safety is equally as important as style, if not more so, and the Avalon does not disappoint. With the standard Toyota Safety Sense Package, you will have things like Break Assist, Pedestrian Detection, Lane Departure Alert, and of course a backup camera to help prevent accidents. Want to hear more about the new technology offered in the 2019 Toyota Avalon? Feel free to call us, we’d love to hear from you!